Abstract: Objective To study the friction between brackets and archwires and the influential factors. 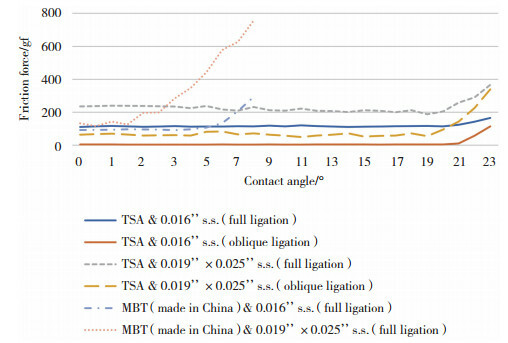 Methods To test the friction of six combinations of canine bracket and stainless steel archwire, and to calculate the critical contact angles for each combination. Results The friction maintains stability with slight changes when the contact angle is smaller than the critical contact angle. 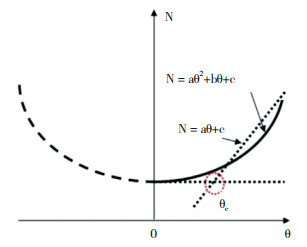 The friction increases linearly when the contact angle is larger than the critical contact angle. 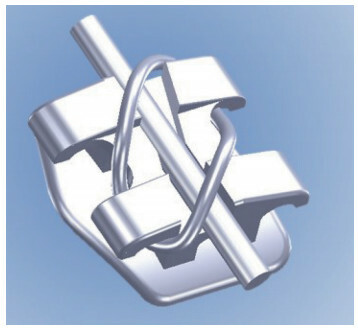 The friction of different combinations of bracket-archwire are different and the critical contact angles are also different. Conclusion The critical contact angle influences the friction between bracket and archwire significantly. The critical contact angle is relevant to both the structure of the bracket and the size of the archwire. 王琦. 传动直丝弓矫治器在口腔正畸的临床应用效果分析[J]. 社区医学杂志, 2017, 15(21): 41-42. KAPUR R, SINHA PK, NANDA RS. Frictional resistance of the Damon SL bracket[J]. J Clin Orthod, 1998, 32(8): 485-489.